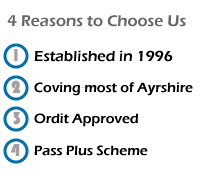 Ordit Approved – Testimonials. – Tricia Moir || School of Motoring, Learn to drive with Tricia Moir school of motoring Information, tricia moir motoring driving tuition, driving instructors in ayrshire, driving instructors in irvine, tricia moir, driving school, school of motoring, ordit approved, DVLA, DSA, Off road driving, irvine, ayrshire Tricia Moir || School of Motoring, Learn to drive with Tricia Moir school of motoring Information, tricia moir motoring driving tuition, driving instructors in ayrshire, driving instructors in irvine, tricia moir, driving school, school of motoring, ordit approved, DVLA, DSA, Off road driving, irvine, ayrshire | Ordit Approved – Testimonials. We are an ORDIT approved Instructor Training establishment giving training in Part 1, 2 & 3 of the qualifying exam as well as retraining for check tests. 2. Traffic signs and signals,car control,pedestrians and mechanical knowledge. 3. Driving test,disability and law. 4. Publication and instructional knowledge. Your pass mark is 85% but you must score at least 20 in all 4 section to pass. This is followed by your Hazard perception you have 13 clips with one hazard and 1clip with two hazards the pass mark is 57/75 .Both theory and Hazard perception need to be passed at the same time. Part 2 your Driving ability. This test is to assess your driving ability you must show a high standard of driving only 6 minor faults are allowed. You will be asked to teach 2 separate 30 minute lesson with the examiner playing the role of a pupil ,in the first phase he will play a beginner or partly trained learner, 2nd phase he will play a trained pupil, all 3 parts must be passed within 2 years front the date you pass part 1. I have always believed that in any line of work there is no substitute for experience. When I began my training with Tricia to qualify as an ADI, that experience was evident throughout. Tricia has had many years in the industry and coupled with a friendly personality, enthusiasm and dedication to her work, she made the learning process easy and enjoyable from start to finish. As a result, I am now enjoying a full time career as an ADI and continue to learn as well as pass on my new found knowledge to my pupils with the help of Tricia and the friendly, professional team at Tricia Moir school of motoring. I have just qualified as an ADI ,what a wwonderful feeling !! Thanks to Tricia ,she got me through it.It was hard work but she had a very positive attitude and was always full of encouragemnt.She had a great way of explaining and simplyfing things,she would alwaysfind a way for me to understand it.Thanks Tricia for all your help and lots of patience. “Thank you Tricia for all of the time you put into my training, especially part 3. 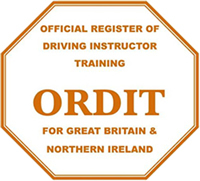 Having had a bad experience with a previous ADI trainer, I was relieved to find someone who knew her job inside out and had the patience and experise to help me achieve a good pass. I was particularly impressed with how you were able to adapt your teaching methods when required so that difficult or complex subjects were more easily understood. “My experience with Trica was a very good start to my new career as a driving instructor. Tricia’s friendly and open approach to teaching meant she tailored her techniques to suit me and being able to contact her any time with questions that I needed answered was never any hassle. Tricia’s technique of teaching made it a lot easier to understand the whole picture of becoming a driving instructor. When you pass and start teaching Tricia is still there for any small questions you might have! Great Help – thanks again Tricia. After failing my part 3 first time round with a well known company.I discovered Tricia Moir from day one I received top class training and went onto recently pass my exam Tricia truly cares about her trainees and you certainly won’t be disappointed. I recently passed my part 3 Training .I would like to thank Tricia not only for the quality of the training she delivered but also the extreme patience throughout our many sessions. invaluable.I found your method of teaching and encouragement given increased my cofidence,overall the whole experiance was positive,as was the end result.I fell that I learned a lot that I can take into my new career as a Driving Instructor.I was such a relief to pass ,once again thank you for your assistance and patience. I really enjoyed doing my ADI training with Tricia .Learning was very informative and fun too. Tricia is able to pass on her knowledge and skills with ease wilst making the pupil feel comfortable,she is also very encouraging and has the ability to build confidance in her pupils and PDI’S alike. Excellent driving instructor with lots of patience and skills to put you through the paces, thankyou very much for supporting me and making me push myself past my boundaries and helping me to become a Driving Instructor. Well what can I say had a fantastic time training was great .Enjoyed the one to one as well as group sessions had lots of ups and down but hey made it in the end . Tricia was very patient and understanding nothing was too much trouble .Many laugh we had cant thank her enough for allowing me to change my career . It can take. A little time to get through all 3 parts but definatatly worth the hard work. Will certainly keep up my CPD and look forward to training towards my first Standards check. Would like to say the training is all worth while and Tricia puts her all Into the training for you .Fantastic team work and friendly environment to work in .A new Career in Driving instruction and a better future to look forward to. Would say all the hard work was worth it . Would total give 10/10 for the service ,help and commitment to my training . Having been qualified as an ADI for exactly 30 years this month, when the invitation to book a Standards Check dropped through the letterbox, I set about some preparation for the big day. In the knowledge that a few things had changed, for example the name “Check Test” is now the “Standards Check” and that the words “pupil centred ” were being bandied about, it was a no brainer to get some first hand information and advice. On talking to Tricia who I had already known for a long time, it was clear that as she’s in the business of training instructors from scratch, she also knew the systems for marking and evaluation of the Standards Check. The first few sessions were one to one, to tighten up on terminology, some lazy instructing and the management of risk. Then a few sessions with a live pupil, which is an eye opener in itself. Things are less predictable with a live pupil and if there’s a way to tighten up risk management, then that’s it. From there it’s the big day and of course, nothing’s predictable. You turn up, adapt to what’s going on and do what seems right. Then the Examiner goes off to mark up the sheet, tot up the score and re-emerges to do a comprehensive debrief, and there you are. It so happened that I was graded as a A, funnily enough with the precise score Tricia had marked me on in the last training session. You pays your money and takes your chance. I’d say, even with 30 years experience, a million learner miles and holding every driving licence available, that if you’ve a Standards Check due, or are finding the job seems now tougher now than before, then consider investing in some training. It’ll definitely not make your life harder. At worst you’ll do it and not be any worse off, but at best you’ll benefit from and easier job, better results and possibly a refresh of some old instruction techniques. I’ll definitely carry on with updating training periodically, rather than waiting till there’s a deadline. In the grand scheme of things it’s probably a bit rich to be telling pupils about the value of paying for extra training from you if you’re not prepared to do it yourself.